Smartphones have become an important way for Americans to communicate, go online, and access and share information. A new Pew Research Center report analyzes smartphone ownership and the attitudes and behaviors of smartphone owners, as well as how these mobile devices have become a primary way for some users to access the internet. 1The share of Americans who own a smartphone has substantially increased since 2011, when Pew Research first began examining smartphone adoption. 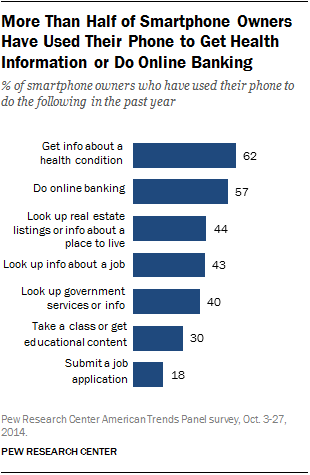 Today, nearly two-thirds (64%) of U.S. adults own a smartphone, up from 35% in 2011. Younger adults as well as those who are more affluent and have higher levels of education are among the most likely groups to own a smartphone. 2Some smartphone owners – particularly younger adults, minorities and lower-income Americans – depend on their smartphone for internet access. Of U.S. adults who own a smartphone, 7% are “smartphone-dependent,” meaning that they do not have home broadband service and have limited options for going online other than their mobile device. Young adults, ages 18-29, are more likely (15%) than other age groups to be smartphone-dependent, while Latinos (13%) and African Americans (12%) are more heavily dependent on their smartphone for internet access than are whites (4%). Lower-income Americans also rely heavily on smartphones for going online – 13% of U.S. adults with an annual household income of less than $30,000 are smartphone-dependent, compared with 1% of those whose family household income is $75,000 or more. 3While texting, talking, emailing and going online dominate, a majority of Americans also use their smartphones for social networking, taking photos or videos, and catching up with the news. 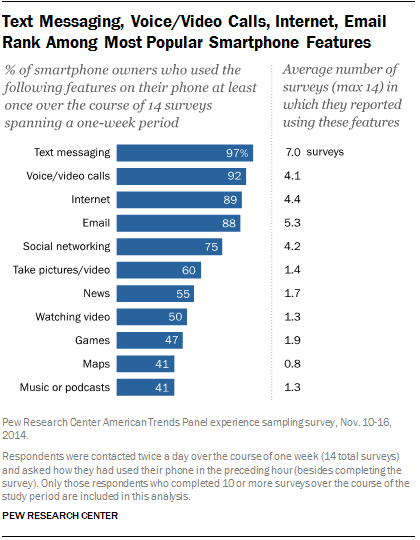 A vast majority of smartphone owners say they used their phone for text messaging, voice and video calling, email and accessing the internet at least once over a weeklong “experience sampling” study. Besides these four activities, other smartphone apps were also popular. Three-quarters of smartphone owners reported using their phone for social media, while 60% took pictures or a video, and more than half (55%) got news on their smartphone at least once over the course of the one-week survey period. 4Smartphones serve as an access point for navigating a wide array of important life events, from health conditions to new jobs. Roughly six-in-ten (62%) smartphone owners have used their phone to get information about a health condition in the past year, similar to the percentage who say they’ve used their smartphone for online banking. Americans are not only using their smartphone to find information about jobs, but they’re also using their phones to apply. Fully 18% of smartphone owners overall have submitted a job application via their mobile device, and among those whose household income is less than $30,000, that share is substantially higher, at 32%. 5How essential is your smartphone to your life? Fully 46% of smartphone owners say their smartphone is something “they couldn’t live without,” compared with 54% who say that their phone is “not always needed.” Interestingly, smartphone owners who depend on their mobile device for internet access are not significantly more inclined than those who have multiple options for going online to say they couldn’t live without their phone (49% vs. 46%). 6Owning a smartphone can be a financial burden for some users. Nearly one-quarter (23%) of smartphone owners have canceled or suspended their cell phone service because the cost was too expensive. This is particularly the case for smartphone owners whose annual household income falls below $30,000, of which 44% have discontinued their service. And while a majority of smartphone owners (80%) say their mobile device is worth the cost, 19% describe their phone as a financial burden.